When is the last time you thought about your own death? I’m guessing not very recently. Most people try not to. In fact, according to Orbis Research, the anti-aging industry is set to reap more than $330 billion annually by 2021. People spend a lot of money trying to stay young so they don’t have to think about dying! But here’s the problem: No matter how much money we spend trying to prolong our lives, everyone still dies! Statistically speaking, 100% of people living today will die. In fact, in the time it took you to read this paragraph, 70 people died. And before you’re done with this sentence, 10 more people will have passed away. Yet for some reason we try to act like it’ll never be us. Yet our inevitable death is quite possibly the greatest teacher of all — if we’re willing to look it in the eye and see it for what it really is. 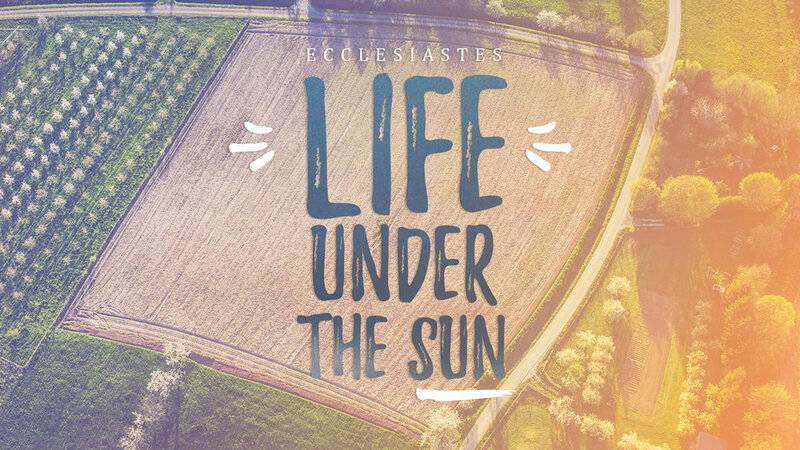 As we gather at River City over the next three months, we’ll be preaching a series of sermons we’re calling, “Life Under The Sun,” studying a little book of the Bible called Ecclesiastes. Ecclesiastes belongs to a section of the Bible called The Wisdom Literature, which also includes the books of Job, Proverbs, and Song of Solomon. It begins with the phrase, “The words of the Teacher…” (Ecc. 1:1). Wisdom literature invites us to sit up and take notice, like we’re in a classroom about to be taught something we’ll need to know for a test. And in the very last sentence of his book, the Teacher tells us exactly what the test will be on and Who’s giving it. So it’s best we sit up and pay attention to what he has to say. Some of you are going to totally relate to the Teacher writing Ecclesiastes, while others of you will be so uncomfortable you’ll want to avoid the book altogether. The Teacher examined everything under the sun, from pleasure and work, to the monotonous things that occupy our time, and comes to the conclusion that it’s all futility. Everything is futile. Maybe your Bible uses the word meaningless or vanity, instead of futility. But no matter what word your particular translation chose to use, they are all translating the Hebrew word, hevel, which means, breath or fog. What the Teacher sets out to tell us is that, like your breath on a cold morning — a vapor that is visible for a few seconds and then disappears — that’s what our days, our work, our lives under the sun amount to. It’s here for a short moment and gone, never to be remembered again. He’ll challenge our view of life under the sun: our working, having fun, making and saving money, even worship. He’ll point out the frustrating fact that no matter what we accomplish on this earth, death still has the final say. The end of Ecclesiastes isn’t the end of The Story. Generations after the writer of Ecclesiastes put down his pen, God the Son would leave his eternal existence above the sun to enter into our meaninglessness under the sun, taking on the skin of humanity — our work, our sweat, our stories, our death— in order to give meaning to every single moment of it. Under the sun, everything is meaningless and quickly forgotten. In and through the Son of God, everything has lasting meaning and purpose and even reward. If you didn’t grow up in the church, it doesn’t matter for this series. You don’t have to know anything about Jesus, or God, or church history, or even know where Ecclesiastes is located in the Bible to understand what the author is talking about. I invite you to go on this journey with me for the next seven weeks as we explore Life Under The Sun.